rt can be like that roadside wreck we just have to watch. Maybe that's why we put up with galleries whose constant drone of visual displays seem to be running on a track: we're waiting for the 20-car pile-up. That said, one has to ask: What is the difference between gallery hopping and Nascar racing? Mainly it's the lack of decisive rules or a definite outcome, ringing truer to our daily life. Even beauty is a form of threat  the threat of ideals, seduction, unwieldy utopian possibilities and the penultimate threat of being perceived as merely cosmetic. Culturally, ostentatious displays of resources can be a harbinger of a future that is unsustainable, or a way to counteract an overly safe set of expectations  like watching the instrument panel. Humanity craves these displays of threat and, much like an itch when scratched, transforms to become a compulsive pleasure incorporated into our neural pathways. These threats as visual disruptions create a salient form of aesthetic need. In the woods, for example, we can experience an honest-to-goodness need to flee from that mama bear running toward us. This prompts a fight-or-flight response, precipitated by visual stimulus  and most humans typically feel more alive for surviving the ordeal. In less urgent terms, city dwellers need to see a new action movie or some great art downtown to break up the urban/suburban monotony. The monotony of our jobs, daily routine and overall trivializing of individual existence is just as threatening as mama bear but, on a subtler level as it involves our spare time, identity and the diminishing returns we get from disposable entertainment. The thing about great art is it can be revisited without exhausting its contemplative and provocative value. Often, the most effective art challenges us to be more perceptive through its veiled and implicit threats. The better art can still sting our consciousness for months and decades after a viewing. The best art is even capable of launching a sneak attack from memory or physical presence  no matter how familiar the image has already become. Thus, even though floods, volcanoes and asteroids are pretty threatening, it is humankind's "success" that threatens civilization most. The Greeks called this constant conflict "Eris." They also made an important distinction: For Eris to occur the opposing sides had to be evenly matched. In art the threat is often handcuffed physically but not visually  allowing Eris to occur via a safe distance. In contrast, that angry mama bear has the odds stacked in her favor. Nobody is going to stand in line for that experience. Thus, art is a good way to contemplate the hopes and fears surrounding the partial utopia we create. Art asks us to perceive if or how we are painting our civilization into a corner. This is nothing new. The engines of novelty and threat have been at work throughout the most ambitious breakthroughs in 20th-century art: Kandinsky's full abstraction, Picasso's pathos, Abstract Expressionism's primordial gusto, Dada's poignant meaninglessness, Pop's bright banality, Minimalism's almost protestant directness, Arte Povera's insistence on humble materials and Earthwork's sentinels were all necessary. Each development fused the nagging conscience of humanity's fears to the individual's pleasure in accepting the disquiet they visually embodied. It's like a pearl an oyster creates to incorporate that irritant into its inner shell. For example, analytical Cubism's sharp, efficient, removed and cold style refined and foretold of the speed and increasingly impersonal nature of the new industrial world. Warhol's "Marilyn" later recast this cultural itch as a reduction and elevation of the individual to commodity. Thus, art can act as cultural benchmark or talisman in regarding real or perceived threats. That is precisely why 19th-century academic painting became outmoded. It was an allegorical art, which was often purposefully designed to buttress and resolve cultural status-quo ideals, not to threaten them. It was kitsch as propaganda and the complete opposite of our current age, where we juggle the prospects of constant or instant information. We also struggle to accept the responsibilities of a threatened environment and our role in complex ecological systems. Suddenly nothing is simple anymore. Postmodernism, Western civilization's last official lens on the world, was reductive and doesn't quite fit our current discursive needs. We have too many things that require action these days. Postmodernism was also heavy handed on the theoretical side, obsessed with signs or signifiers. It never really got down to the business of answers, or at least movement towards them. Somehow it just lacked resolve. Essentially, Postmodernism was Western civilization coasting on its momentum and driven by a dazzling market. The art was there to support the discourse and replenish the market exuberance  often unjustified by the actual work. Basquiat and Serra are notable exceptions, though, since threat is central to their work. Still, I challenge anyone to explain what, if any, insight David Salle added beyond James Rosenquist's masterworks. Overall, the last 30 years were great for aesthetes like Arthur Danto (The Nation), but his voice has been overrun by the powerful personal subjectivity of critics like Dave Hickey and Matthew Collings. It was as if Postmodernists thought "hope," one of the core aspects of humanity, could be rationalized out of existence. Good luck with that one. The individual still matters. During its still-ongoing development, Postmodernism often overused its best tool, deconstruction, essentially dissecting any definable trait while neglecting to reinsert the findings into the larger and messier contexts. The effectiveness of a theory can be judged by the results it produces. This abuse of deconstruction essentially wheeled out thousands of interesting lab experiments, otherwise known as Postmodernist "theme" shows. It was a time when interesting was good enough  especially if the result was an exposé on marginalization and victimology. It became forced. But let's not throw the baby out with the bath water. Deconstruction is insightful when reinserted into broader contexts. It just isn't too useful when studying trust, hope, beauty, threat and all the other things that keep civilization together and working. Postmodernism presupposes that things are broken and rambles like some old codger who hates everything with a touch of wistful nostalgia. Yet it is obvious some real important things do work, giving humanity its resilience. Why hide from this truth? In a new century (just like the last one) we require something more, a need for direction, not a destination. The "now" requires an additive, layered perspective that incorporates complexity. Yet it must be unlike Modernism's "damn the consequences" optimism or Postmodernism's broad, politically correct, top-down sociological brush strokes. In an information age, we know the better and more detailed the data, the more accurate the model. It's a place where the individual is the main engine of distinction and detail. Also, any new discourse needs to be more conscious of causality and interrelated systems. We are in a building mode for a new way to look at the world, and I'm proposing a holistic but rooted approach based on primal needs (food, water, shelter, locomotion, mating, etc.) and core perceptual mechanisms (optics, biological releasing mechanisms, morphemes, posture, touch, taste, clothes, etc). Focusing on the basic needs and tools of our existence can cut across cultural lines and explore the detailed machinations of humanity, examining its consequences, distinctions, triumphs and directions. It resembles anthropology of the present and, potentially, the eternal. We now have the opportunity to grab the rudder and steer ourselves into what kind of human race we are to become. Right now there is no definitive development, there is no official paradigm, and it has made the art world and other cultural entities very reflective, if not edgy. It is the healthy threat of change. I think of it as an opportunity to take stock and get back to basics while on the Industrial Revolution's roller coaster. Among the essentials, we are looking at the way art relates to us as an organism, both culturally and individually, instead of taking it for granted or as an excuse for jargon. Since threat is one of the key atavistic or essential things an organism must continually identify for survival, I propose the new art discourse can use threat as a starting point. Three artists, Richard Serra, Damien Hirst and Takashi Murakami, owe their relevance to threat and their mastery of it. All three have a way of building Trojan Horses filled with the wiliest of Greeks. Typically, the more relevant the art, the more exceptional the horse  and the more dangerous the Greeks contained in its belly. Art can capture the subtler, more insidious threats we humans pose to ourselves. For example, Richard Serra's huge, tilted metal sculptures threaten to fall on us, asking us to face our categorical faith in architectural engineers who design steel skeletons for high-rises and bridges. 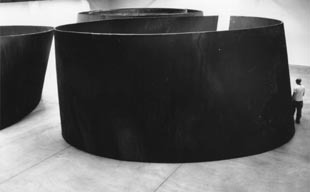 By removing us from the bridge or building, Serra forces us to face the essence of big, heavy steel and gravity. We rely on both but they can be deadly. The threat is just the beginning. Serra also transmutes these elements into the sublime by creating sculpture that has rigorous control and exacting symmetry in its form. Visually, this implies that intelligence and craftsmanship went into the work and therefore we can expect it not to kill us. The effect is just like living through a fender-bender: our mind speeds up while perception of time slows down. Thus, while in the presence of a Serra, the viewer will have more perceptual time to be aware. Real threat and serious art should share this perceptual effect; it means we are paying attention. Another artist who deals in threat with beguiling clarity is Damien Hirst. A Brit, Hirst is known for vitrines (display containers) filled with sliced-up animals and his love of medical paraphernalia. Hirst's most successful work is a massive vitrined shark suspended in formaldehyde. His perfect title, "The Impossibility of Death in the Mind of Someone Living," proves the effect of the work was not accidental. By enshrining a cold-blooded super-predator and agent of death in a perpetual specimen display, Hirst distills the primal threat of nature and humanity's own garish potential to analyze and grid. Leave it to a Brit to try framing the tiger's "fearful symmetry." Also, the shark is whole  not sliced like many of Hirst's animals. Thus, the work acknowledges the Ozymandius-like futility of our own actions and alleged greatness as a species. We can't dissect something like our mortality; it is a more holistic enterprise. This particular vitrine creates a sneak attack by taking the fish out of the water, thereby decontexualizing its former deadliness to highlight and implicate its now very human analytical threat. Hirst's vitrine exposes the very human traits of vanity, overanalyzation and limited lab-like environments whose results might be based on oversimplified information and assumptions. Finally, the tank of formaldehyde seeks to cheat death, as if it were merely a cosmetic condition. There is ridiculousness to the vitrine, which reinforces and mirrors the "impossibility" aspect as well. When definitive analysis becomes impossible  that, too, is a threat. 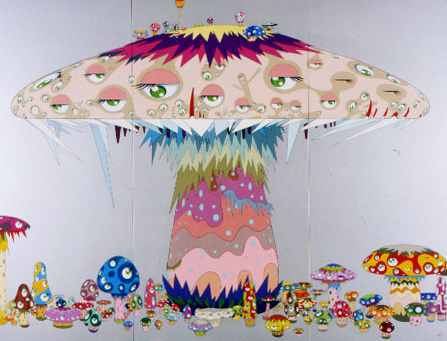 Japanese sensation Takashi Murakami's art has combined the threat of his culture's pervasive past and current reality into something like the unholy union of Edgar Allan Poe and Hanna Barbera's Schmoo cartoon character. 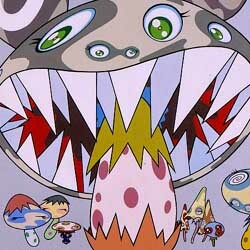 In particular, Murakami's forests of cartoon mushrooms covered with swarms of impassive eyes and shark-like rows of triangular teeth seem like a marketing campaign that has gone cannibalistic  more likely to bite than entice the shopper. The relentlessness of the eyes speaks of the delicate dance of vitality and stability that cultures and their individuals must dance together. In this instance, Murakami's ever-watching eyes act like a panoptic prison warden: tyrant and provider both. The homogenized eyes mirror how the Japanese culture pressurizes its individuals to fit in, co-opting the windows of the individual souls themselves into a communal mutation of interconnected fungal growth. This disquiet has to do with Japan's swift and artificial adoption of non-indigenous cultures. The Japanese adopted the technology, design, look and some institutions both of Western and Chinese culture without really assessing the future costs of introducing non-native species. Murakami's mushrooms certainly invite comparison to nuclear blast clouds, the most spectacular consequence of adopting Western Imperialism. His work is sneaky, emphasizing the pervasive threat of identity rather than the occasional monstrous visitations of Godzilla, Japan's last nuclear spokesmodel. Murakami calls this omnipresent leveling of art, fashion, film, music, etc., into one interchangeable discourse: Super Flat. What could be more threatening to a three-dimensional creature or hierarchical culture than a Super Flat landscape, where the dog of Western civilization  marketing  has gone feral in the East. This is historical, but Murakami's work addresses the evolving phenomenon in medias res. The words of both Plato and Confucius are out of their depth when searching for answers to Japan's identity crisis. Murakami has put a historical exclamation point on an essential question: What is to become of Japan? His art threatens that it might not change very much at all. Who is afraid of the big bad Art? All three of these artists are more likely to hold up to history because their threats hit on both a personal and cultural level. Cultures rely on individuals to instigate and navigate their collective hopes and fears by transforming threat into a kind of systemic consciousness. These threats become benchmarks, like Serra's time-bending gravity, Hirst's romance of the lurid and Murakami's ability to bite the culture that feeds him. Threat is essential if pleasures beyond the saccharine are to be attained. Threat is what keeps civilizations from becoming some pupa in a cocoon feeding on itself with incestuous thought, limiting its ability to adapt. Threat is the prime-motivating agent: don't think for a second it isn't important to the art world. Postscript: Since these ideas have been of prime interest to me for the last 10 years, I deliberately left out any reference to the Sept. 11 attacks. Threat isn't some passing fad, it is just a fact of life. E-mail Jeff at pivotofjade@hotmail.com, and see the nw drizzle archives.